Parents may feel guilty and angry if they can't soothe their baby. The period of PURPLE crying tells us that if a baby is not ill and parents have tried to soothe baby, it is alright if they cannot stop baby from crying. Some babies are going to cry no matter what. The good news is that the period of PURPLE crying will end! 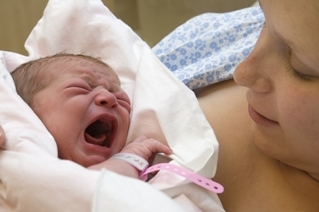 The image of a mother holding her crying baby has been purchased from http://www.dreamstime.com.